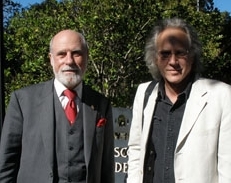 On Nov 11 2008, Stanford campus radio personality Robert Harrison interviewed Vint Cerf on his KZSU program “Entitled Opinions (about Life and Literature)”. Vint recalls his youth as a Stanford undergraduate before describing the genesis of the IP/TCP protocol and prognosticating on the Internet’s future, including Google’s role. He also speculates on time travel, infinite longevity via cyborg integration, and other exotic topics.